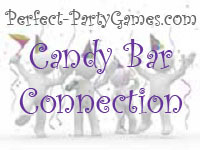 Summary: Candy Bar Connection is a guessing game where clues are given about different candy bar names. 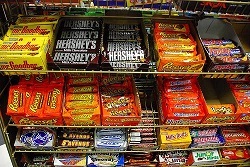 Equipment: One each of several candy bars from the suggested list below. The player who correctly identifies the most candy bar names wins the game. I like to give the candy bar to the person who guessed it's name. These are only suggestions. You can make the clues as hard or as easy as you want. If you can't find a candy bar on this list in your region, substitute another popular one for your area.